Shipping to mass doors in November, the argan-oil-infused color polish. Shipping to mass doors in November, the argan-oil-infused color polish line is the brand's biggest launch since Miracle Gel, and is estimated to earn $80 million to $90 million within the first 18 months on shelves. 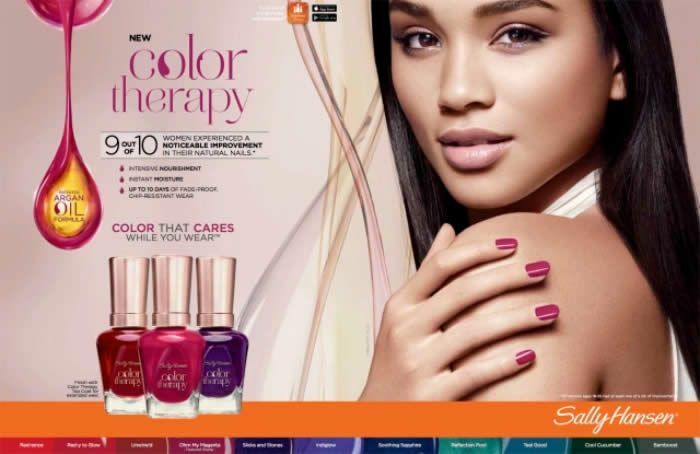 With the merger of 41 Procter & Gamble properties complete, it’s time for the new Coty Inc.’s coming out party and the new innovations are already under way, starting with Sally Hansen Color Therapy, the brand’s biggest launch since the blockbuster Miracle Gel. Coty declined to comment on projections, but industry sources estimate Color Therapy could produce retail sales between $80 million to $90 million in the first 18 months. While that sum doesn’t rival Miracle Gel’s enviable $120 million within 18 months the biggest launch since introductions started being tracked in mass market doors, according to IRI it should provide a considerable jolt to the languishing nail category. The polish line fuses color and care by imbuing a nourishing and moisturizing proprietary oil blend into 38 splashy, trend-driven hues, a top coat and a nail and cuticle oil. Shipping into mass doors next month, it is entering the market at an opportune time, as women seek strengthening and conditioning remedies from damage due to salon-applied gel nails, without sacrificing color. The launch marks a return for Sally Hansen to its treatment roots, and while the nail category is down overall, the timing is significant, as retailers depend on the brand to serve up innovation that moves the needle. Sally Hansen has long stood for both color and care and the Color Therapy line represents both of these,” said Shannon Curtin, senior vice president of North America for Coty’s consumer beauty division. This marks Curtin’s first major launch since leaving Walgreens to join the company in May. “Consumers are seeking exciting news to give them a reason to buy that extra bottle of polish given they increased their purchase rate the last couple of years,” explained Curtin. 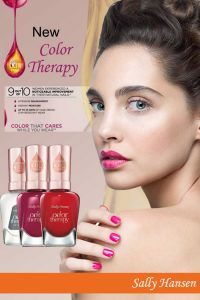 “Color Therapy offers the unique benefits of instant moisture and nourishment while providing a noticeable improvement to natural nails…with a gorgeous shade palette so she doesn’t have to sacrifice wearing the color she loves.” Color Therapy ushers in the use of argan oil in the mass nail category. Heralded for its therapeutic properties, argan oil also resonates strongly with the mass consumer, according to Chandra Coleman, vice president of U.S. marketing at Sally Hansen. Though Color Therapy contains a proprietary blend of argan, acai and evening primrose oils, Coleman said argan oil was chosen as the hero ingredient because of its familiarity and if consumers don’t know its healing properties intimately, they’ve likely seen it in other beauty products across mass. The fusion of color and nail care was the result of intense consumer listening. “Color Therapy was inspired by ‘her’ telling us that while she’s hard on her nails and needs a break from polish-wear, she doesn’t want to go a day without color because they look dull,” explained Jeremy Lowenstein, Coty’s vice president of global marketing of Sally Hansen. This isn’t a ripple, it’s a tidal wave,” he added, referring to consumer demand for vibrant color with added conditioning properties. In the U.S. prestige market, nail care brought in $6 million for the 12 months ended May 30, up five percent from the previous year, and the premium market has already seen a bounce in sales from healthier products such as Orly’s Breathable Treatment + Color and OPI’s Gel Break, a professional in-between gel manicure treatment system. Color Therapy is a unique fit in our portfolio,” Lowenstein said. “It is entirely incremental and addresses different consumer needs. It isn’t Miracle Gel; it isn’t Insta Dri. We aren’t just innovating to innovate, this is innovation with a purpose.” In fact, the company expects minimal cannibalization from existing color offerings since Color Therapy delivers new benefits. With a suggested retail of $8.99, it is priced $1 below the two-step Miracle Gel’s price tag and in line with Complete Salon Manicure. For the first time ever, Sally Hansen’s Global Color Ambassador Madeline Poole handpicked the shades. Just because there is a “good for your nails message,” Poole said that didn’t eliminate the drive for on-trend colors. Her final edit, designed to flatter all skin tones, includes three palettes the Rich Tones; the Pinks and Corals, and the Nudes. “Each color is highly pigmented, which lends itself to simple, sophisticated nail art as well,” Poole added. And to help navigate the right shade selection for skin tone, there’s Coty’s mobile app, ManiMatch, which will carry all the Color Therapy shades starting in November. To distinguish Color Therapy from Complete Salon Manicure and Miracle Gel, a rose gold cap inspired by jewelry trends was adopted. A 360-advertising-campaign is set to launch late this month, beginning with viral online sampling campaign to generate ratings and reviews. Efforts will include digital, TV, print and an influencer and multimedia public relations outreach. Faced with a somewhat intricate message to parlay, Lowenstein called the campaign “immersive,” fusing on and off-line tactics to educate, with digital as the primary focus. “Digital continues to be a bigger piece of how we talk to our consumers,” Lowenstein said. One strategy is the use of cinemagraphs, a hybrid of a video and a still photo where one or two elements are animated to catch attention. “We are one of the first nail brands to use this,” he said. There is also ample use of a droplet image to signify the oil in the formula which is hammered home in a social campaign called #dropeverything. That theme encourages women to “drop everything” and take time out for themselves. “What we heard from women about why they get a manicure or pedicure is the want a moment of me time to drop everything,” Lowenstein said. Retailers familiar with the line have been waiting for what they called a “spa manicure product” from Sally Hansen. But first, buyers hope it can return the luster to the nail-care category. “There are so many knockoffs of gel polishes, we’re ready for something new,” observed one buyer.